I am not a fan of commercially produced dips. Yes, I will admit, that there are some companies out there that make absolutely sensational natural vegan dips that are available at health food stores. However they often come with a high price tag. I am more referring to the dairy laden, colon clogging, “run of the mill” dips offered at generic grocery stores. I urge you to stay away from those! I believe – as usual, home-made and fresh is best! 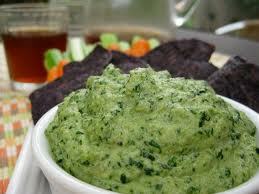 Especially when home-made dips are just so quick and easy to prepare. Besides, how satisfying is it to have someone come up and ask you, “Yum – where did you get that dip”? It is always nice to be able to say – “I made it. It is super easy. Do you want the recipe”? Mix this together in a food processor for about 5 minutes until creamy and the consistency of ricotta. Don’t worry if it is a little bit dry – you can tweak the consistency when you add the other ingredients. Then gently sauté the following ingredients except for the spinach in a pan on medium heat just until the onions are translucent. Place the raw baby spinach in a large mixing bowl and pour the fried mixture on top of the spinach. Mix lightly. Put all of the ingredients in the food processor with the cashew “cheese” and blend until pureed and smooth. The mixture should be the consistency of a thick creamy dip. Serve with chopped raw vegetables or crackers. YUM!